Hi guys! I’m glad to be back doing Good Books / Bad Covers! If you read my blog regularlly or follow me on twitter, you will know by now that I’m obssesed with fantasy books, both YA and adult. So I think it comes as no surprise that this week I chose another fantasy series to be on my Good Books/ Bad Covers post. I just love these books so much, that I would hate for someone not to read them because they have ugly covers. 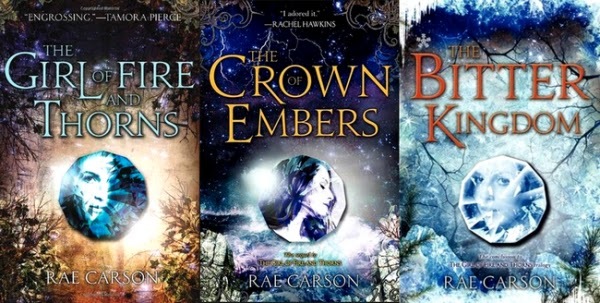 The series I chose is the Fire and Thorns series by Rae Carson. – There are a lot of amazing female characters through the series. They represent all kinds of girls and that’s amazing. – The main characters are POC, even if it’s a fantasy world, the readers can tell that most of the characters are latinxs, which is great! – The romance is amazing, it’s definitely a slow-burn romance that doesn’t start until “The Crown of Embers”. – If you like character development, this book is perfect for you, because the main character Elisa, goes through a lot of it. – There are a lot of great secondary characters, especially, Storm. You are just gonna love him, trust me! – There’s a really strong political aspect to this series that makes it really entertaining. There’s a lot of political intrigue and maneuvering. – Elisa is a Chosen One, but she has known all her life, so it’s really interesting to see the effects that has on her, all her doubts and the conflict of destiny vs choice. – There’s an aspect of body issues that’s really well handled in this series, which it’s rarely seen in fantasy. I love this idea for a blog post series! We really do judge books by their covers, don't we? Thanks for the reading suggestion! hahaha – it's funny because I think I held out so long on getting my hands on this series precisely because the covers were so lame XD But then the praise kept coming in AND I found a cover from another region I MUCH prefered so I ended up ordering it. I still have yet to read it but I WILL do so soon. From what you describe here, I know I'm in for a treat! !